Reindeer has been busy. The tree is beautifully-decorated, the presents are wrapped and ready, the table is set with delicious morsels to gobble. All is looking perfect. But Reindeer feels lonely. His family live so far away--on the other side of the world. So he packs up his suitcase with gifts and sets off to visit some local friends. First, it's cat, then dog, then guinea pig, who each invite Reindeer to stay and enjoy the new gift. But Reindeer misses his family. He's keen to get home and have a nice glass of iced chocolate. He settles into his armchair and drifts off to sleep. But wait! What's that noise on the roof, waking Reindeer from slumber? Could it be!? A clatter of hooves? A heartwarming story of reunion and the magic of Christmas, kids can try to guess what kind of gift his family bring him at this special time of year. 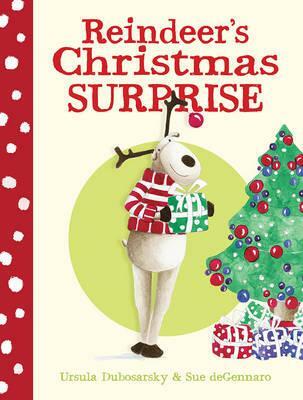 Sue deGennaro's truly gorgeous illustrations make this a stunning festive gift for any little reindeer--er, child.